When Mitel announced the acquisition of ShoreTel in July 2017, the company promised it would be combining the strengths of the both organizations to offer unique benefits for SMBs and enterprises. Earlier this week, roughly one quarter after the acquisition closed, Mitel released its rebranded and integrated portfolio of cloud and on-premises solutions for North America. On the cloud side of things, Mitel is offering MiCloud Connect (previously ShoreTel Connect Cloud) with Teamwork and Contact Center; and MiCloud Flex (previously Mitel MiCloud Enterprise) with MiCollab and MiCloud Contact Center. For on-premises solutions, Mitel is offering MiVoice Office 250 with Phone Manager applications; MiVoice Connect (previously ShoreTel Connect Onsite) with Connect UC and Contact Center; and MiVoice Business with MiCollab and MiContact Center Business, Mitel said in a press release. "North American businesses are rapidly moving to the cloud, but they are not all doing it at the same pace or with the same configuration," said Bob Agnes, president and executive vice president of products and solutions, Mitel, in a prepared statement. "Our customers need choice and a clear technology path forward." BlueJeans Network announced a partnership with Dolby last spring, rolling out its BlueJeans Rooms with Dolby Conference Phone solution to customers in July. Having experienced a 63% increase in demand during the first six months of availability, as BlueJeans announced in a press release earlier this week, the company is now offering a new configuration of the product that focuses on audio conferencing and content sharing for scenarios where video might not be required, Mark Strassman, chief product officer at BlueJeans, told me in a briefing. This new configuration is aimed at making it easier for businesses to make the transition to huddle rooms and collaborative meeting spaces, Strassman said. Some businesses simply aren't ready to outfit every room with video, so this configuration gives them the option to add in video at a later point, he said. "The least common denominator for meetings is the audio has to work. You need to hear and understand." BlueJeans Room with Dolby Conference Phone has a spatial audio configuration that lets call participants feel as if each speaker is in a different part of the room. It also features built-in noise reduction technology, which Strassman demoed to me by holding a powered-on hair dryer to his head while speaking. The noise reduction technology blocked the sound of the blow-dryer while letting me hear everything Strassman was saying. While the 802.11ax Wi-Fi standard isn't due for finalization until 2019, Aerohive is getting ahead of the game with a family of 802.11ax access points (APs) for the enterprise. Most of the Wi-Fi enhancements made over the years have focused on faster speeds, but the new 802.11ax standard focuses on efficiency and making Wi-Fi smarter, as Matthew Edwards, Aerohive director of product marketing, told me in a recent briefing. When compared to previous generations, 802.11ax will have nearly equivalent upload and download performance; incorporate a new channel sharing capability to handle client density better; use wake-time scheduling to improve battery life; and deliver four times more throughput than 802.11ac, Aerohive said in its press release. 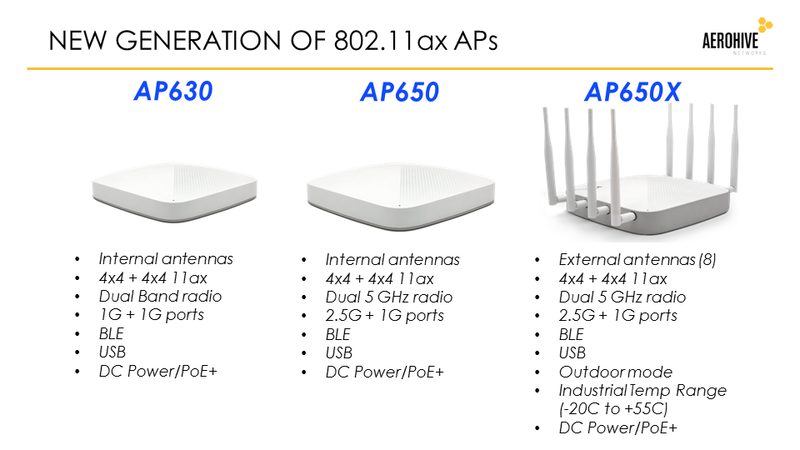 Aerohive's 802.11ax family comprises three APs: AP630, AP650, and AP650X, as shown below. Applied Voice & Speech Technologies (AVST) has released the latest version of its CX-E unified communications platform, CX-E 9. Enhancements include expanded ability to scale, multitenancy, and support for Microsoft's Encryption File System for end-to-end secure messaging, the company stated in its press release. CX-E 9's multitenant capability, for cloud deployments can support the storage of up to 5 million messages as well as 60,000 users, AVST said. "Probably the biggest success of CX-E that enterprises find so attractive is its flexibility," said Jim Burton, founder and CEO of CT Link and regular No Jitter contributor, in a prepared statement. "It can be deployed on premise[s] or in the cloud. It can also integrate with all telephony and email systems, premise[s] to cloud, from any UC vendor -- Cisco, Microsoft, Avaya, Google, and more." Wireless platform provider Mist announced availability of a cloud-based virtual network assistant (VNA) for operations and integrated helpdesk, powered by its artificial intelligence engine, called Marvis. The VNA uses natural language processing to make it easier for IT to query the Mist cloud for real-time monitoring of mobile client activity, the company stated in its release. The VNA is capable of answering questions "on par with a wireless domain expert," Bob Friday, Mist CTO and co-founder, said in a prepared statement. It can identify Wi-Fi issues; understand the impact of those wireless problems; correlate events across the mobile devices, wireless networks, wired networks, and IoT domains; and issue automated alerts for anomalies, for example, the company said. Learn more about all these topics -- UC, video, Wi-Fi, and cloud -- at Enterprise Connect 2018, March 12 to 15, in Orlando, Fla. Register now using the code NOJITTER to save an additional $200 off the Early Bird Pricing or get a free Expo Plus pass.